The Museum of Contemporary Art Chicago presents a major retrospective with “Takashi Murakami: The Octopus Eats Its Own Leg.” Many of the Japanese artist’s works, spanning creation over more than three decades, are shown in North America for the first time, alongside a selection of his most recent — and never-before-seen –paintings. Hallucinogenic mushrooms, technicolor daisies, jellyfish eyes: this is the wild, vibrant, imaginative universe showcased by Japanese artist Takashi Murakami. Born in Tokyo, Murakami studied at Tokyo University of the Arts, earning a BFA, an MFA, and finally a PhD in 1993. Trained in the Nihonga style of painting, which utilizes mineral pigments for their pure colors and craftsmanship, Murakami remixed this tradition with explicitly contemporary content, undercutting the self-serious categories of the art world. 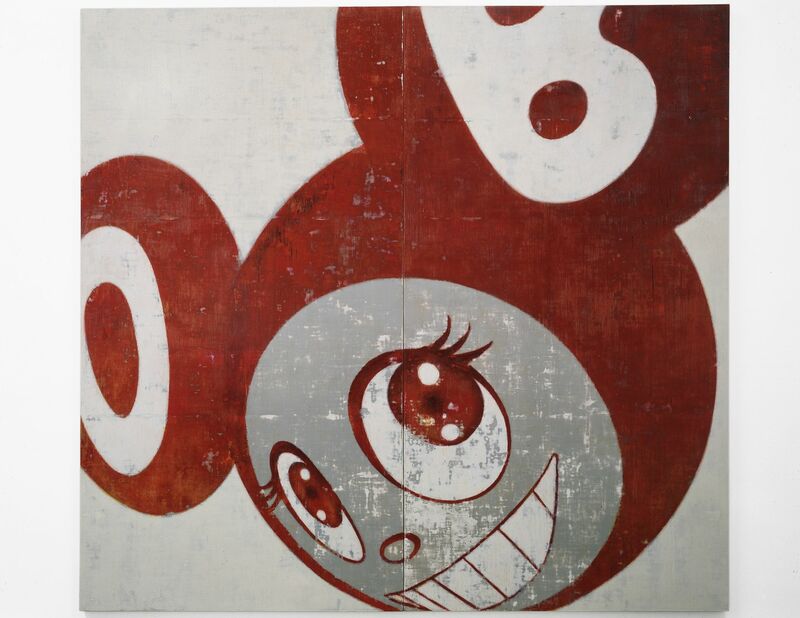 Murakami is as known for his commercial output (including collaborations with pop icons such as Kanye West and fashion house Louis Vuitton) as his art, but this exhibition firmly emphasizes his work as a painter. The 50 works were selected by MCA Chief Curator Michael Darling, who has worked with Murakami for years, and previously curated the artist’s Superflat exhibition at the Museum of Contemporary Art in Los Angeles in 2001. Inspired by Pop Art and mass production, folklore and popular culture, Murakami refuses to divide between high and low art, Eastern and Western aesthetics. His cast of characters notably include the recurrent Mr. DOB, his cartoon-ish alter-ego first created in 1993, who eventually turned into a radioactive mutating monster; Murakami’s other signature motifs include anime eyes, jagged teeth, and bulbous letterforms, which inhabit not only paintings and sculptures but also toys, stickers, and consumer goods. His signature style, which he dubs “Superflat,” pairs traditional Japanese painting techniques with an animé- and manga-tinged bent. For the exhibition, Murakami produced new paintings shown for the first time, including “The Octopus Eats Its Own Leg,” a 114-foot masterwork made up of over 35 panels encircling the gallery. The title of the work — and the exhibition at large — is based on a Japanese saying regarding the process of rejuvenation. An octopus in distress can chew off a damaged leg to ensure survival, knowing a new one will grow in its place. Similarly, Murakami revisits imagery, his own and that of Japanese history, to produce new work. Murakami also recently revived his creative partnership with rapper Kanye West for a new painting, presented here for the first time. Following its presentation at the MCA, the exhibition will travel to the Vancouver Art Gallery in British Columbia, Canada (winter 2018) and to the Modern Art Museum of Fort Worth in Texas (summer 2018). In the meantime, “Takashi Murakami: The Octopus Eats Its Own Leg” is on view at the MCA Chicago from June 6 to September 24, 2017.